The Eagle Harbor Inn is a fabulous discovery that we know you will love! Late afternoon homemade treats served in main inn: hot mulled cider and homemade pumpkin bars or lemonade in summer. DoorCountyNavigator.com loves this inn and we know you will too! Highly Recommended! Be sure to tell them DoorCountyNavigator sent you! Spend New Years Eve in our beautiful one bedroom whirlpool suite with a doubled sided fireplace for $139.00! Suites are filling up quickly! Book today to reserve your suite or Inn Room and ring in the New Year in beautiful Door County! Only 10 minutes away from the grand Cherry Drop in Sister Bay! New Year's Eve Packages are also available for two night stays! New Year’s Eve Resolution Package! Take time out to review & renew your goals for the New Year~Inn style! Treat yourself for Two Nights in feather down dreams in our elegant Whirlpool Suites while soaking, fireside, in your 6’ whirlpool with bath grains & cozy robes. Let us pamper you with some party favors & Mimosas Makings to Ring in the New Year! Wake to Breakfast in Bed, delivered on New Year’s Day and take a late checkout! Inn Rooms Currently Available: Starting at $103 for our traditional queen room with our European Style Breakfast. 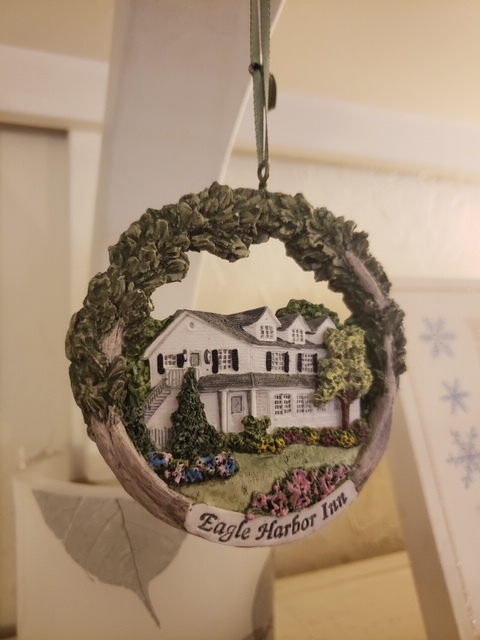 Eagle Harbor Inn is a Bed & Breakfast (B&B) with historic elegance as well as modern conveniences, with warm, beautifully decorated rooms, all with private baths. But that’s not all. The innkeepers are genuinely committed to customer service. It shows in all they do—from how the inn is decorated to how the breakfast and other offerings are made to the way Eagle Harbor Inn partners with other businesses in Door County and creates benefits for its guests. Eagle Harbor Inn (open year-round) is unique in that it has a B&B on the center of its property. And surrounding the B&B in a 1930s historic building, are architecturally distinct houses —each with one and two-bedroom elegant guest suites with whirlpools. The entire property sits on five acres in a walk-to beach, shops and restaurants location. While the accommodations are diverse and offer you much choice, they are only part of the Eagle Harbor Inn story. The innkeepers—Natalie and Nedd Neddersen are all true hospitality and take pride in the quality of their homemade bakery and the offerings they make for their guests as well as to the community. “Fresh and homemade—that is our handle,” Natalie says. “Everything about us is homemade and we feature Door County special ingredients.” Read on to learn more. 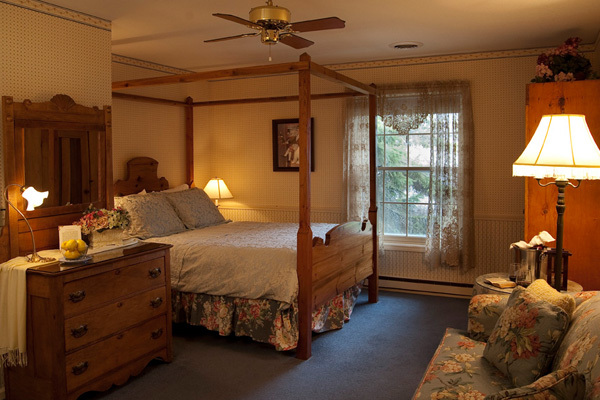 In Eagle Harbor Inn’s B&B are nine rooms with private baths. Each has its own decorating scheme and is named for a historic innkeeper of Ephraim. 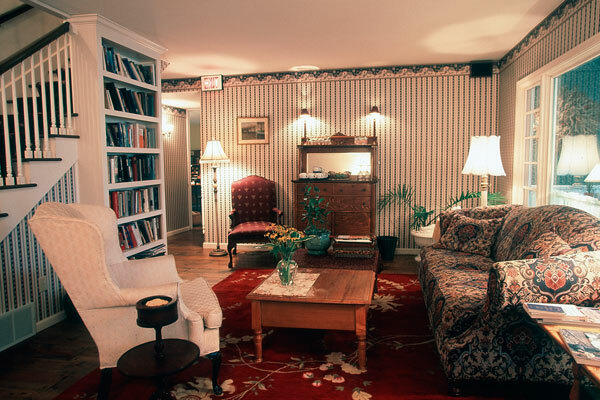 The B&B rooms are equipped with flat screen televisions/DVD players. Meanwhile, houses (resembling charming farmhouses) surround the inn building and offer a total of 32 one and two-bedroom suites. They have private bathrooms, kitchens, six-foot whirlpools in the master bedroom, two-way fireplaces, beautiful Eastlake furnishings and many other amenities. New in 2012 is carpeting in the suites and flat screen televisions. The Commons Building, on the gorunds, has indoor current pool, exercise room, WiFi; large Gathering Room (can accommodate receptions up to 74). But at the heart of this inn is its breakfast and bakery (prepared for guests as well as the public). Natalie is quick to recognize two experienced bakers on staff, who each ran their own Door County-based bakery or coffee shop in the past. Guests of the B&B enjoy a hot breakfast. Starters may include cherry granola (made and sold here; it’s very popular), cherry cider (“we feature cherries in everything,” Natalie says), orange juice and Door County-brand coffee. A hot entrée may be something as scrumptious as cherry-stuffed French toast. Also available is homemade bakery product of the day—such as apple cake, sour cream bundt cake, cherry streusel or cappuccino chip muffins, cinnamon pecan coffee cake, crumb cake. Don’t miss the homemade Door County deep dish cherry pies. “We are firm believers in starting with excellent ingredients to have an excellent outcome,” Natalie says. But you don’t have to take her word for it—or even stay at Eagle Harbor Inn to find out. The bakery products are available for purchase. People purchase the pies as well as coffee cakes. 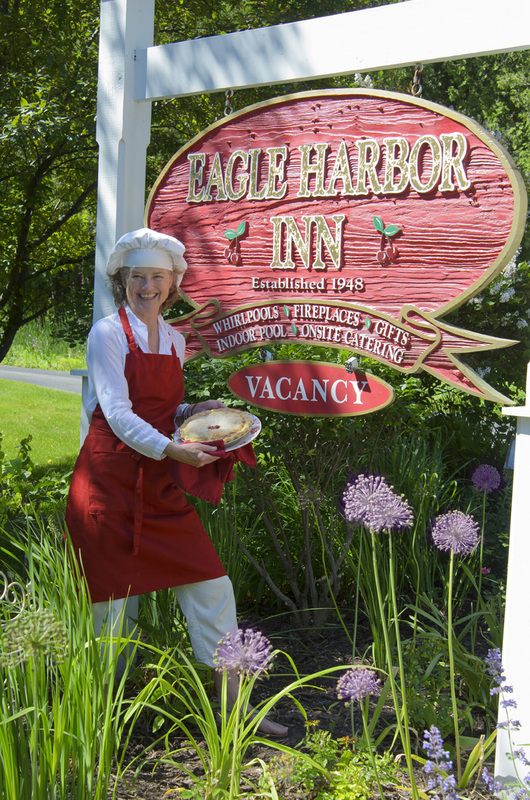 Many Door County organizations also turn to the Eagle Harbor Inn for bakery, too. Oh, and ask about their holiday Christmas cookie boxes as well as holiday pies (pre-order please) for Thanksgiving and Christmas. Packages even include Eagle Harbor Inn’s homemade truffles. Now, if all this information is not enough to convince you to make a reservation, then perhaps one of Eagle Harbor Inn’s fabulous overnight packages will. The winter package (Nov. 1 through May 1) includes two nights in a whirlpool suite, luxury bath products, homemade truffles, champagne or cider on arrival as well as breakfast in the bed the first morning. Guests can also choose to have a massage at the Spa of Sacred Grounds or Lori’s Spa Essence. A New Year’s package is available for a one or two-night stay. And in January, Eagle Harbor Inn is part of a progressive dinner along with partners Hands On Studio, Door County Trolley and English Inn. Speaking of partners, Eagle Harbor Inn is also partnering with Door County Bike Tours, a new company offering bike tours throughout Door County. Guests stay at the Eagle Harbor Inn at night and enjoy a wide variety of things during the day including art and cooking classes, plays and concerts and biking of course. And Eagle Harbor Inn loves its neighborhood. In fact, you can check out the neighboring Ephraim businesses—Wilson’s Restaurant and Ice Cream, Water Street Gallery, Ephraim Clayworks, Beach People, Leroy’s Water Street Coffee, Good Eggs and other places on the Eagle Harbor Inn Web site. 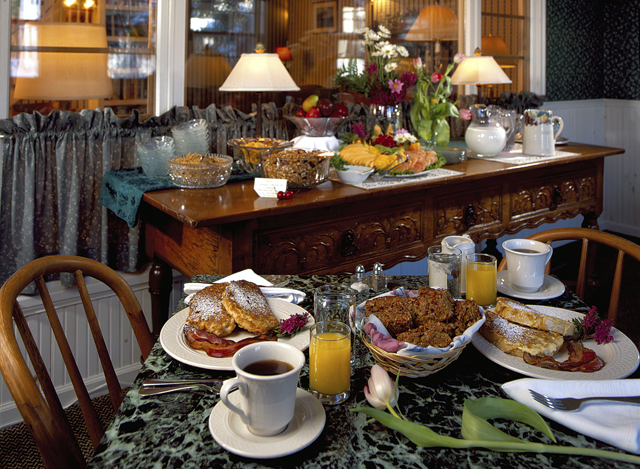 So, with the diverse accommodations, commitment to quality breakfast and, most important--customer service--, it is easy to understand why Eagle Harbor Inn appeals to a wide variety of clientele –from couples to families—and that the inn has a high retention rate and referral rate. And when you are looking for a place in the winter, this is it - they are open! DoorCountyNavigator.com has been delighted to have Eagle Harbor Inn as part of our Web site for many years. We strongly encourage you to stay at this inn, or at least stop in and buy a pie or coffee cake. We are certain you will be delighted. And please tell them DoorCountyNavigator.com sent you (refer to Property ID# DCNAV-9914)!